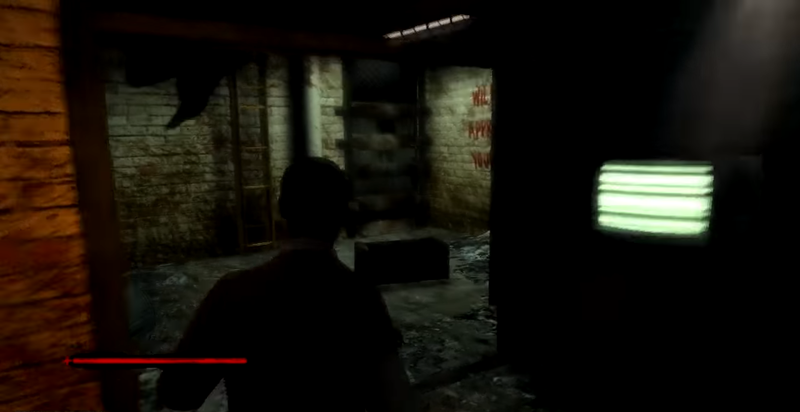 Though it now seems unlikely to be remembered as such, Saw was more than the spiritual successor to Silent Hill that Konami purportedly intended it to be. It was arguably the seventh gen Silent Hill that we were never quite given. Zombie Studios' effort isn't perfect, but it revitalised many facets of the survival horror experience that had been relegated to the fringes, since as a genre, survival horror was already transitioning towards straightforward action horror. Through strong puzzles and palpable atmosphere, unflinchingly gruesome environs, threatening foes and multi-faceted characters, Saw brings a lively tension to the desolate asylum in which it is set. Saw places the player in the role of David Tapp, a detective obsessed with catching the serial murderer and kidnapper known as Jigsaw. The masked assailant believes his victims haven’t valued their lives, and thus makes them fight for them in a sequence of grim trials. Having captured Tapp, Jigsaw informs him, as well as everyone else in the asylum, that he has a key to escape the asylum sown into his torso. Creepy, and rather a problem for the central protagonist, as not only must Tapp survive a myriad of traps in his attempts to rescue those involved with his own life, he's also a marked man. Whilst Konami horror games have long been renowned for their memorable monster design, Saw deserves a lot of credit for a change of tack in this regard. Whereas many survival horrors trot out grisly monsters, Saw is all the more menacing for the human behavioural element it chooses to explore instead. As you would imagine following abduction, and winding up in a life-or-death struggle, the range of reactions is broad and deliciously unpredictable. Some are timid, seeking to run from Tapp as soon as they see him. Others react with considerable aggression, attacking with melee weapons or flailing around madly. If you bide your time, groups sometimes batter down the weakest individuals without the need for your involvement, whilst the sneakiest foes stick to higher ground for the odd outdoor section, lobbing Molotov cocktails whilst typically staying out of reach. 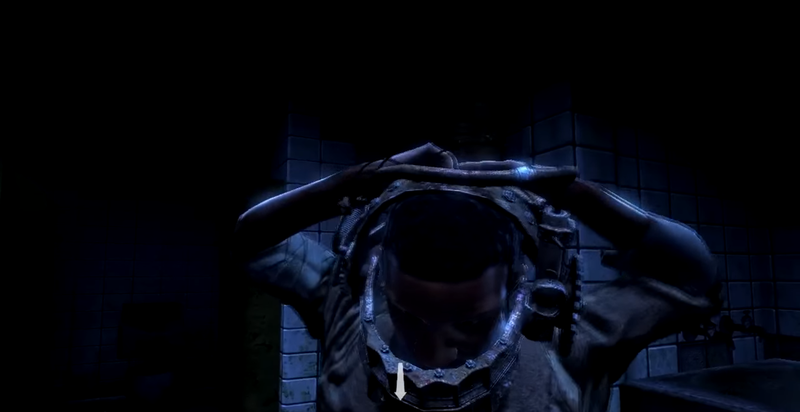 Furthermore, some enemies have traps that will cause Tapp's “shotgun collar” to blow if he's not able to put some distance between himself and his assailant. Incapacitating a foe alleviates this issue, but it's also plausible to close and bolt a door, saving Tapp and condemning his attacker with no risk of accruing damage. A moody ambience is aided by some detailed, smartly designed surrounds. Saw is not a pretty game, at least not from a purely aesthetic point of view, but it certainly succeeds in its plethora of cool little details. Every now and then, you’ll catch something out the corner of your eye, with just the right frequency to keep the player on edge. There are constant reminders of those who’ve failed to rise to Jigsaw’s dark challenges, with the remains of those less fortunate visible in rooms with the telltale [0:00] clock a grim confirmation of the engineering of their demise. Lighting and visual sleight-of-hands are similarly impressive, with mirrors and light switches often the key to uncovering unsettling messages or clues to puzzles. In any event, it's nice to be encouraged to explore your environment, as it lends the game weight. Illumination is predictably limited, though there are a trio of ways to combat this; traditional Silent Hill fare in the form of a lighter or a torch, and also a camera, which creates dizzying, bright, but brief bursts of exposure. It’s a nifty addition, though quite disorientating. What an awful state. Tom's basement hasn't been cleaning in DAYS! It’s a fraught, busy gaming experience, packed with action, suspense and gameplay. The very first thing you're tasked with is to frantically remove a reverse bear-trap from Tapp's head, and from there on in, the pressure rarely lets up. Basic exploration demands attention as you'll encounter a host of instant-death tripwires, booby-trapped doors demanding quick reactions to quell, as well broken glass that can sap the health of careless players. A myriad of high-jeopardy puzzles, usually played out against a daunting time limit, helps generate further tension. Saw has some issues, and the combat in particular is a mixed-bag. On the one hand, it scores points for the strong selection of makeshift melee weapons found strewn about the asylum, and for the ability to craft your own traps, luring enemies to their deaths on tripwires, like a really, really dark version of Home Alone. Weapons have finite durability, so you’re encouraged to stay active in looking for your next means of defending yourself, playing further to the feeling that Tapp isn’t safe. On the other hand, there are times when, just as with Silent Hill: Homecoming, the combat system feels sluggish and unrefined. It’s also true that the pighead boss in the closing stages of the game, where the intent is likely to lead him into a fenced pen and electrocute him, can instead be beaten by halting his attacks through simply hammering the punch button. Still, there's more than enough action to keep horror fans hooked until its conclusion. Six lengthy chapters provide a decent sized adventure, and there's no shortage of gameplay, with some tough puzzles and trap rooms that will test gamers' mettle. There's relatively little in the way of replay value sadly, with trophies mainly focusing on achieving a kill with all of the different weapons, and the two endings are accessible one after the other thanks to a chapter select. Branching events based on decisions and successes is a well-worn idea admittedly, but Saw's trap rooms the variety of responses from the people you save could have lent itself to further alternatives, more endings and more replay value, but this is a relatively small complaint. Saw successfully channels Silent Hill in what is a thematically simpler, but more content-heavy survival horror experience. Its scares are more visual and pressure-related, but whilst its not quite as impressive a work as Silent Hill, it certainly succeeds in creating atmosphere and scares. What it lacks in style, it goes some way to making up for with its wealth of tense puzzles and admirable focus on gameplay. It's scary, at times gripping, and though Saw does start to flag a bit in terms of variety in its closing stages, it will give fans a satisfying dose of horror, with plenty to admire, and plenty to be scared of. "Whereas many survival horrors trot out grisly monsters, Saw is all the more menacing for the human behavioural element it chooses to explore instead....plenty to admire, and plenty to be scared of."